There’s a lot of rubbish and there has to be some kind of filter. So I’m not against the idea of a filter but what I am against is the idea of applying the filter in a very partial kind of way. So it’s not the filtering per se that got me disappointed with TED but the manner in which they have done the filtering and the sloppy justification after the fact. We disallow speakers who use the language of science to claim they have proven the truth of ideas that are speculative and which have failed to gain significant scientific acceptance. Then TED named names with the word “pseudoscience” in the same paragraph. We will be especially interested to hear about the ideas that Marianne Williamson, Russell Targ, Larry Dossey, Paul Nugent, and Marilyn Schlitz will be presenting.We feel that the pseudoscience struggle is an important one. TED and TEDx cannot be platforms that give undo legitimacy to false evidence and selective logic — regardless of brilliant packaging. I’m familiar with most of the names mentioned above but I don’t know enough details about their work to agree or disagree with TED’s assessment. However, I strongly object to lumping Russell Targ into the category of “pseudoscience.” The fact that TED has pointed a finger to Russell Targ leads me to speculate that the TED staff are ignorant (or maybe just dismissive) of the Remote viewing literature. I don’t claim expertise on the subject of remote viewing but I’ve been familiar with the literature for more than two decades now. I understand the remote viewing protocol — it’s double-blind. The late Ingo Swann was instrumental in designing the protocol. Then it was taught to a few intelligence personnels in the military (one of them is remote viewer #001 Joe McMoneagle). I’ve always focused my attention to the original people who started it all because they did solid research on the phenomenon and they’re the ones who designed the original protocol. Russell Targ and Hal Puthoff had a deal with the CIA and the Defense Department that in return for funding they helped the military with intelligence work (e.g. locating people and cites of interests). Another condition was that Targ and Puthoff were given free rein by the military to publish their work in scientific journals. The classified project — Stargate Project — lasted for more than two decades. I don’t know about you but I don’t think Targ/Puthoff/Swann could’ve hoax the Defense Department, CIA, FBI, and even NASA for a long time, especially when millions of money were involved. The Defense Department might be wasteful in their spending but I don’t think the people running it were that stupid to be fooled for two decades without them getting valuable results. In cancelling the TEDx event in West Hollywood, it appears that I was accused of “using the guise of science” to further spooky claims, (or some such). People on this blog have asked what I was going to talk about. That’s easily answered. I was co-founder of a 23 year research program investigating psychic abilities at Stanford Research Institute. We were doing research and applications for the CIA, Defense Intelligence Agency, Air Force and Army Intelligence, NASA, and others. In this $25 million program we used “remote viewing” to find a downed Russian bomber in North Africa, for which President Carter commended us. We found a kidnapped US general in Italy, and the kidnap car that snatched Patricia Hearst. We looked in on the US hostages in Iran, and predicted the immanent release of Richard Queen, who was soon sent to Germany. We described a Russian weapons factory in Siberia, leading to a US congressional investigation about weakness in US security, etc. We published our scientific findings in Nature, The Proc. IEEE, Proc, AAAS, and Proc. American Institute of Physics. I thought a TED audience would find this recently declassified material interesting. And no physics would be harmed in my presentation. Even before the TEDxWestHollywood controversy, blogger Craig Weiler already called the Sheldrake-Hancock controversy as “The Psi Wars Comes to TED.” And with this latest controversy with TEDxWestHollyWood and Russell Targ, TED has officially got in the middle of the Psi Wars. The Psi Wars just went nuclear on TED. Remote viewing is an ability that many people can easily learn. It is a nonlocal ability, in that its accuracy and reliability are independent of distance. Dean of Engineering Robert Jahn has also published extensively on his experiments at Pronceton, (Proc. IEEE, Feb 1982). I am not claiming it is quantum anything. It appears to possibly make use of something like Minkowski’s (8 dimensional) complex space/time that he described to Einstein in the 1920s, and is now being re-examined by Roger Penrose. This is not necessarily The answer. But the answer will be some sort similar nonlocal space/time geometry. We taught remote viewing to 6 army intelligence officers in 1979. They then taught a dozen other officers, and created an operational army psychic corps at Ft. Meade, which lasted until the end of our program in 1995. You can see two examples of real remote viewing on my website, www.espresearch.com. One with Hella Hammid is double blind, live on camera for a 1983 BBC film, “The Case of ESP.” available on Google. Too bad Targ won’t have the opportunity to share on the TED platform his more than twenty years of research on remote viewing. Good thing there’s Youtube. Here’s one of Targ’s presentations on remote viewing. It would be interesting to see how this TEDxWestHollywood controversy plays out. I’ll be watching this with glee and anticipation. 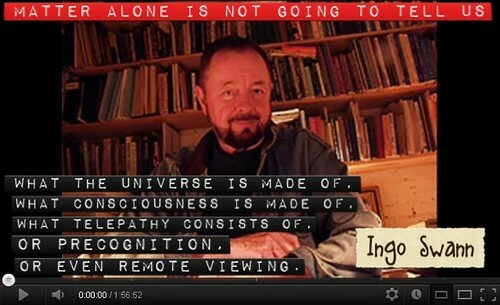 In the meantime, speaking of remote viewing, check out this lecture by Dr. Michael Persinger on his remote viewing experiments with the late great psychic, Ingo Swann. I guess Michael Persinger — a prolific scientist who works on the fringes — will also be persona non grata on the TED platform. I think in a way this whole controversy and the people who have weighed in in favor of TED’s actions do indeed confirm what I’m saying. These dogmas are ones that most people within science don’t actually realize are dogmas. They just think they’re the truth. The point about really dogmatic people is that they don’t know that they have dogmas. Dogmas are beliefs and people who have really strong beliefs think of their beliefs as truth. They don’t actually see them as beliefs. So I think this whole controversy has actually highlighted exactly that. Exactly. Here’s to Science being Set Free. P.S. Russell Targ has just published a new book where he has divulged declassified information in the CIA remote-viewing program. TED will never dare touch this material. So you and I will just have to rely on our own research and other alternative media sites to be informed. Case in point: Here’s a good interview with Russell Targ on The Paracast. UPDATE (04/06/13): Let’s get it on! Looks like exTEDWestHollywood is moving forward with their event. it will be livestreamed for FREE here. And here’s a preview of Russell Targ’s upcoming exTEDWestHollywood talk in LA on April 14. UPDATE (04/06/13): It’s the FOIA, Stupid! Here’s another excellent post on the interwebs (see “Targ, TEDx and the Nature of Legitimate Research“) which illustrates how wrong TED was to lump Russell Targ with pseudoscience. “The research papers in this archived data are mindboggling. TED obviously has forgotten that all legitimate researchers begin with the existing literature. And it is important not to let cognitive bias prevent you from looking at research that doesn’t fit your belief system. That reminds me… I noticed the annotation for file 11841, a 23 page document, is “Quantum Physics and Parapsychology” Conference report 28 Oct 1974.” Have you read it? Exactly. Ignorance of information is not absence of information. Ignorance of past research is not absence of research. And here’s the home run point from the perspective of National Security. “Notice that, in removing the talks discussed, they also removed the opportunity to share them or to open them directly on Vimeo. TED does NOT want some ideas to spread — even if they are ideas that several governments (China, USSA, and the US) found important at the highest levels of National Security. Here’s what I posted on TED Conversations: Discuss the note to the TED community on the withdrawal of the TEDxWestHollywood license. btw, for those who are not familiar with the scientific literature on remote-viewing, do yourself a favor. please look into the history of SRI, Hal Puthoff, and Russell Targ. don’t just take the “skeptics” word for it. follow the data wherever it may lead and draw your own provisional conclusions. you can start with this lecture by Hal Puthofff, Russell Targ’s colleague at SRI, talking about their remote-viewing experiments with the late great Ingo Swann. then let your curiosity do the googling. you’re welcome. And while you’re at it, I also recommend this presentation by Hal Puthoff at The Arlington Institute. I don’t know about you. But for me these ideas are damn worth spreading. UPDATE (04/07/13): All Hail the Great Jacques Vallee! Since TED was critical of Russell Targ and seemingly dismissive of the scientific and declassified FOIA literature on Remote Viewing, let me offer this. Here’s talk by Jacques Vallee at the International Remote Viewing Association (IRVA). For those who don’t know who Jacques Vallee is, BLAME YOURSELF! Just kidding. Jacques Vallee is a legend in the alternative research community. and incidentally, Vallee did a TEDx talk at TEDxBrussels. If Jonathan Swift hadn’t written Gulliver’s Travels someone else would have had to today. What’s that saying about great minds and mediocrities? Multiple and major tactical error on their part. Same thing happened to me, Brian Josephson and David Peat at a meeting in Italy organized originally by me and Michael Towler. Details are on the Wikipedia page on me. You Can’t get any more scientific then Russel Targ! Anyone who hears him or talks to him knows that! He’ll tear anyone’s work to shreds if he believes that it wasn’t carried out according to the scientific methodology, if double blind, even triple blind, repeatable methodology wasn’t used. The TED people have made a grave error. Also, I’ve seen their other presenters from a teenage boy talking about his concerns for the environment to the neurologist talking about her own experience while having a stroke. They weren’t discussing any scientific facts. I think we should boycott TED until they reverse their decisions and issue an apology to the men such as Targ and Puttoff and Sheldrake who have devoted their entire lives to science and it’s application for advancing human evolution and consciousness. TED isn’t just withdrawing an invite, it’s actually invalidating their entire life’s work and careers and in doing so just invalidated itself. is based on limited information from relatively small sections of DNA. Medical Hydrotherapy refers to the use of sanitary, temperature appropriate, non-aggressive water massage. therapies, and expensive psychiatric treatments. Once you become popular, one is inclined to become safer. I think this is Ted’s present situation. This was posted by c4chaos on Thursday, April 4th, 2013 at 12:06 am. Bookmark the permalink.